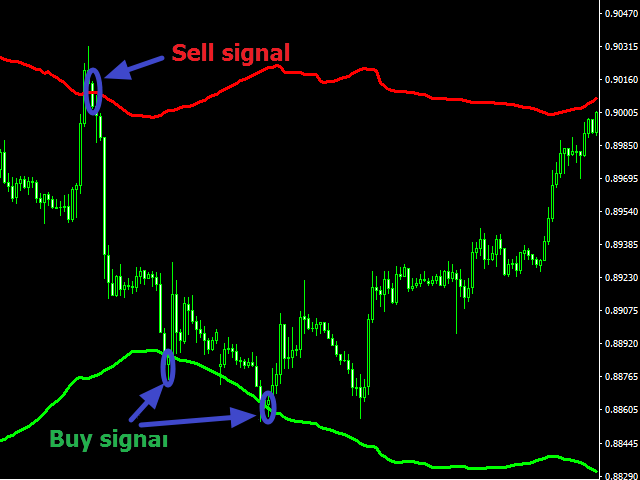 Magic Channel Free is a channel indicator for the MetaTrader 5 trading platform. This indicator allows finding the most probable trend reversal points. Unlike most channel indicators, Magic Channel does not redraw. The alert system (alerts, email and push notifications) will help you to simultaneously monitor multiple trading instruments. Attach the indicator to a chart, and the alert will trigger once a signal emerges. With our alerting system, you will never miss a single position opening signal! Excellent for identifying trend reversals. Suitable for beginners and experienced traders. Chart customization (the size and color of lines). Buy when the price crosses the lower line of the indicator upwards (see screenshot 1, entry points are encircled). Open Sell orders when the price crosses the upper line of the indicator downwards. The indicator is best suited for intraday trading, on the timeframe from M5 to H4. Period - averaging period for calculating the indicator (key parameter). PRICE - price for calculating the indicator (OPEN or CLOSE). Coefficient - channel width ratio. The higher the value, the wider the channel. Push - send push notifications. clrUPPER - the color of the upper indicator line. clrLOWER - the color of the lower indicator line. Evgeny Belyaev - professional programmer and successful trader. 2. Fixed bug with alert.